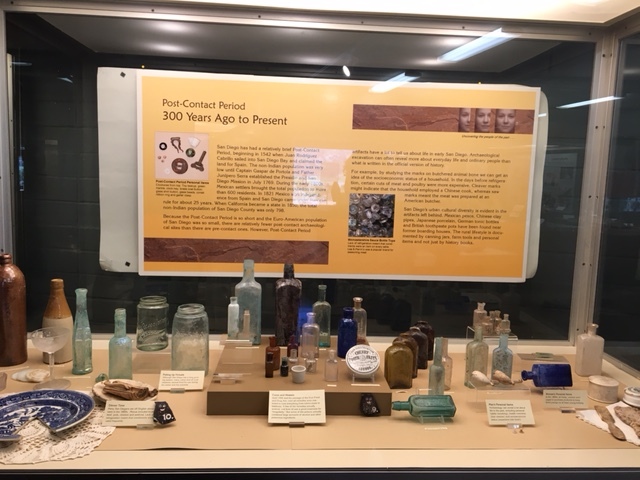 While speaking to a tour group at the Rancho Bernardo Museum last week, I mentioned the San Diego Archaeological Center and got some puzzled expressions. So I mention the center this week as it remains one of the hidden gems of the county’s historical community and deserves to be known to a wider public. The 10,000 years of history referred to in the title of today’s post refers to the history of human habitation in San Diego County, from the original Native Americans to the settlers from all continents who came after. As a result of that history, there are upwards of 17,000 archaeological sites in the county, more than in some entire states. As you can well imagine, this wealth of buried history faces destruction by the demands of development. That’s why regulations such as the California Environmental Quality Act were created to ensure excavation and removal of historically significant artifacts from development sites. Unfortunately while these regulation provided funding for digging up and removing artifacts, they didn’t fund equally for curation: the preservation and use of the artifacts after excavation. That’s where SDAC came in. This single building, a converted elementary school in the San Pasqual Valley, is a repository and exhibit space for San Diego County’s heritage. They started out with 10 boxes of artifacts in 1998. 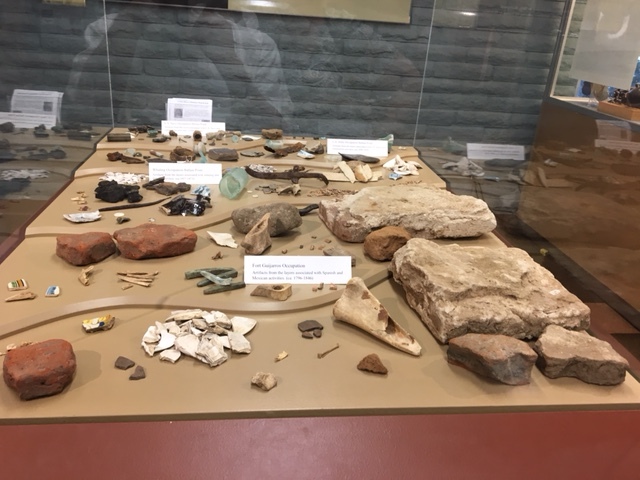 Today, “We have over 1,008 collections representing 2,876 archaeological sites,” said Cindi Stankowski, Center Executive Director in a recent interview. “Altogether they total 5,014 cubic feet. We can take up to 10,000 so we still have room,” she said optimistically. The center is open to the public, with regular exhibits as well as classes and special events. 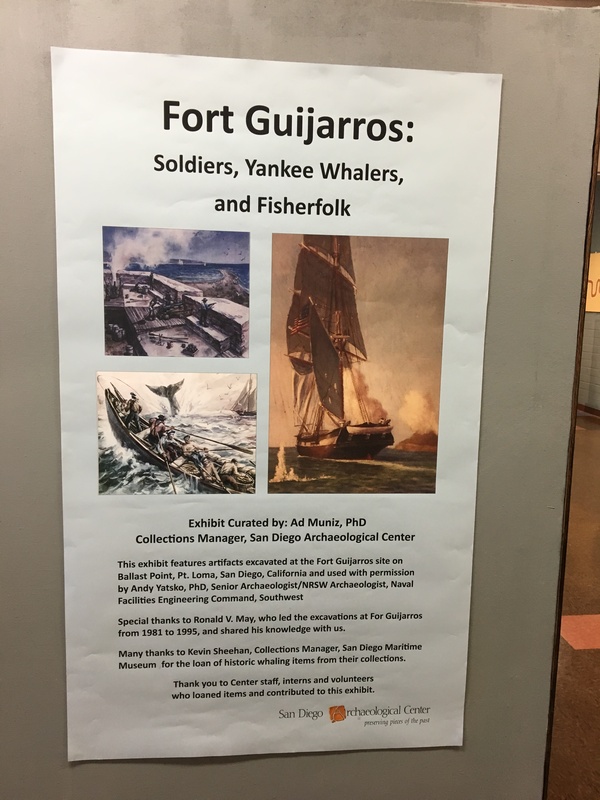 So you can go see examples of pieces of our human past, from Native American stone tools to adobe bricks and oxen yokes used by 19th century American farmers, or harpoons used by whalers of the same era. Below are just a few examples of exhibits from a visit I made last weekend. To find out more about this special place, check out their website, http://sandiegoarchaeology.org/ . You can also find them on facebook, https://www.facebook.com/SDArchCenter , and on twitter, https://twitter.com/sdac .